The three shells that set this work apart are coated, so that they shimmer in the light, a different sort of “bling” I suppose. 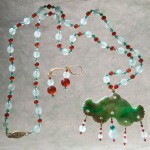 They were so unusual, I thought I’d like to try to design a set of jewelry with them. 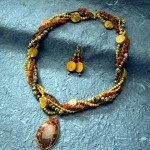 They certainly dominate this piece; you hardly notice what other components are in the necklace at first, don’t you? They are extremely fragile; one actually got broken in shipping, even with the protective coating and though it was packed properly. 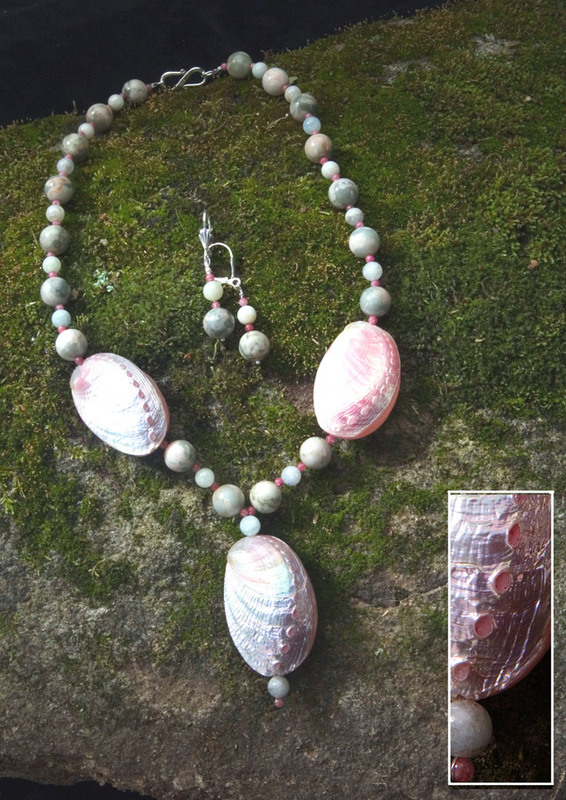 They look like one pictured on Wikipedia, an Abalone named Dohrniania and are naturally pink. 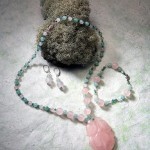 I got a strand of dyed blue ones too; perhaps I’ll make them up in a piece with only crystals to separate them. They certainly would be noticeable across a crowded room. 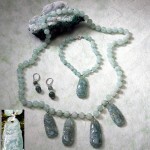 The 6mm beryl beads are Aquamarine, though opaque (please see Treasured Stones page). Their neutral color blends in well with the subtle pink and cream in the Peace Jaspar, whose green is complementary to the shells. Here is another instance of Sea and Earth coming together.